"It was the occasion for the greatest outburst of joy in the history of mankind. There had never been anything like it. The end of that godawful war had finally come." I know people who refer to The History Channel as The Hitler Channel due to what is perceived to be an inordinately heavy rotation of programs geared toward World War II and the Third Reich. While it is true that the channel does run quite a bit of material on the subject, I happen to find it consistently informative and educational, so on a personal level I don't really have a problem with it. 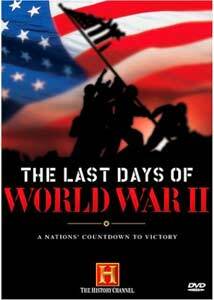 They have tackled the subject once again with this two-disc set entitled The Last Days of World War II, in which two separate History Channel docs have been seamlessly dovetailed to make one full-length feature (running 137 minutes) that chronicles the last six months of the war, using a blend of interviews and rarely seen archival footage. Death of the Reich, which takes up the first 70 minutes, covers the eventual downfall of Hitler's regime, despite his hollow promise of its power lasting 1,000 years. The end of Hitler's reign is covered from a number of different battle-related angles, all leading to the eventual end of the war. Some of the material doesn't necessarily paint the Allies in a perfect light (case in point is the controversial bombing of Dresden, here described by survivors in explicit detail), and the concentration camp footage is nothing short of horrifying. This segment is subdivided into the events leading up to the end of the war, followed by a fascinating look at the war crimes trials in Nuremburg, including a lengthy look at the mysterious suicide of Hermann Goering. Spoils of War makes up the second half of The Last Days of World War II, and the subject here is the hordes of gold, artwork, and valuables stashed away by the Nazis, as well as the technological advances (specifically a sophisticated fighter plane and the V2 rockets) that Allied forces wanted a piece of. Here is where we learn about the underground salt mines used to store staggering amounts of gold and pilfered treasure, along with the specialized Allied recovery teams sent in to locate and retrieve objects of art. The tug-of-war between the might and strength of the United States and Russian military, both of whom fought against Hitler for very different reasons, hints at the Cold War rumblings of two nations that would become great enemies in the decades to follow. The History Channel seems to have a pretty good grasp on how to put together well-structured documentaries, and The Last Days of World War II is another outstanding effort. The rich content, built around interviews with a wide range of officers (German, American, and Russian) and comments from authors and historians, is augmented by some truly amazing archival footage. Image Transfer Review: Retaining its original broadcast aspect ratio, The Last Days of World War II is presented in 1.33:1. The interview segments look decent and presentable, though colors that are not particularly vivid; the quality of these talking head segments is exceedingly average. The extensive archive footage varies in quality, though for the most part the image detail of this old material is quite good, considering its age. Audio Transfer Review: Audio is provided in 2.0 stereo, typical of most History Channel DVD titles, with little to differentiate it from sounding any better than a typical television broadcast. The narration and interview segments are clean and hiss-free, and the post-production sound effects added to the archival footage are never intrusive (except during the horrible mixing job done on the Last Secrets of the Axis, one of the extras found on Disc 2). Extras Review: Over two hours of extras can be found on the second of two discs in this set, and they offer a more focused look at two little-known stories from World War II. The first is USS Eagle 56: Accident or Target? (44m:06s), originally broadcast as an episode of The History Channel's History Undercover series. Hosted by 'SCUD stud' Arthur Kent, this segment examines the events surrounding the mysterious sinking of the USS Eagle off of the coast of Maine in April 1945 that killed 49 men out of its 62-member crew. The Navy blamed it on a faulty boiler malfunction, but survivors claim to have seen a German U-boat just prior to the midday explosion. Using interviews with the last three surviving crew members of the USS Eagle, the piece follows the nearly 60 years it took the Navy to eventually reverse its ruling on what actually happened, thanks in no small part to the diligent detective work done by the sons of one of the men who died that day. The second segment is Last Secrets of the Axis (01h:33m:05s), hosted by Roger Mudd, and in this installment the strange chain of events that led to the German-Japan alliance are discussed, including the pivotal role played by a former geography professor named Karl Haushofer, who is often referred to as "Hitler's Merlin". Haushofer's story is one that is seldom heard, and will probably be a real eye-opener to many, as he is credited with not just coining the term "geopolitics", but for being a key figure in the creation of the Axis Pact, as well as being a force behind Hitler's Mein Kampf. The only downside to this particular segment is that the sound effects added to the archival footage are mixed way too loud, and more often than not become a distraction, especially when you fixate (like I did) on them. The main feature is cut into 18 chapters. This two-disc set of solid History Channel docs on the final days of World War II is an easy recommendation for those looking to expand their knowledge base. Great educational content, all balanced by reels of sometimes quite graphic archival war footage.